This is the second blog in a series of three on why and how companies are moving their building security management to the cloud. In my last blog, I discussed one of the biggest obstructions in a move to the cloud – security. If you’re now convinced that the cloud is a secure move, then the next question becomes, what are the benefits of moving my security management to the cloud? Depending on your perspective, there are quite a few benefits, but I thought I would have some fun and show you why utility companies make such a move, according to IDC research. This industry, by the way, is very security conscious, so keep that in mind as you read the following reasons. Significant cost savings. One of the primary benefits of the cloud is that it can reduce your IT and day-to-day operating costs considerably because of a low total cost of ownership. Cloud implementations only require a minimal upfront investment because secure servers and IT infrastructures – as well as development, support, maintenance, and other operations – are all managed by a trusted service provider. 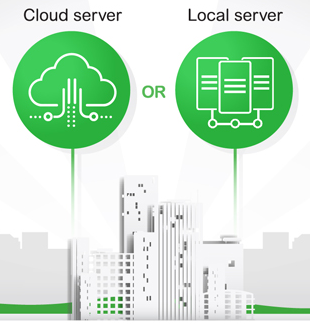 This eliminates the need you to have proprietary hardware, software, or servers locally or anywhere. Your company’s cost savings are extended even more because cloud-based security can typically be easily integrated with your building management system (BMS), which optimizes your investment in existing technology. What about the utilities companies? 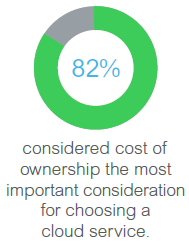 Eighty-two percent considered the total cost of ownership as the single most important consideration for choosing a cloud service. Already in the cloud. When I work with facility managers and building owners, I ask if their companies already have any applications in the cloud. Most have some sort of solution in the cloud, whether it’s email, HR, or customer relationship management. In fact, according to IDC research, over 85% of enterprise companies already have made investments in the cloud or plan to do so soon. On average, 44% of these companies have their IT environment in the cloud and they expected this to continue to grow to nearly 60% by the end of 2016. As for utilities companies, 74% of the ones surveyed indicated that a public cloud is their dominant, long-term platform strategy to meet IT needs. Increased innovation and performance. There is one factor that is usually indisputable when talking about the cloud – and that’s the cloud services providers typically offer companies with the latest, most evolved technology. Enterprise building security management is no exception. With a move to the cloud, your company could take advantage of leading-edge innovation that provides high performance, mobile access, and easier maintenance, deployment, and scalability. Utilities companies apparently are already taking advantage of this, as 87% recognized the value of cloud services to provide better business continuity and disaster recovery than traditional technology. Better, more robust security. As I mentioned this in the last blog, one of the most reassuring factors for people considering the cloud is that cloud service providers typically have the latest, most innovative cybersecurity tools in place. These tools use technology that is usually more advanced than what your enterprise may use in house, so there is a strong probability that you would experience inherently less risk. Utilities companies agree with this benefit. 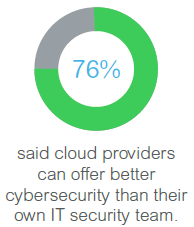 In fact, 76% recognized that cloud providers can offer better cybersecurity than that offered by their own organization’s IT security team. Although I don’t have any correlating data from utilities companies, I do want to offer up one more reason why companies move to the cloud. The reality is that because of all the benefits above, a move that can help your future-proof security environment. The innovation and cost savings of a cloud implementation can ensure that your investment in the future can be greatly protected. You don’t have to plan and prepare for massive updates and upgrades of existing systems, or extensive build-outs to replace outdated technology. Your cloud provider would take care of all of that, with systems that are continually up-to-date and at the forefront of evolving technology. If you are considering moving to the cloud, but are still hesitating, why not download this white paper, Security Management: Is the Cloud a Viable Option? It will give you an overview of security management market trends, as well as recent research on what other companies are doing today with their security operations. It also offers more insights and guidance on why organizations move their security to the cloud, and the value of such a move. And finally, it can give you insight into what the key requirements are for a security management system that will keep your enterprise secure.